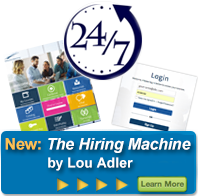 In this short video Lou Adler demonstrates how to use Performance-based Hiring to measure and predict Quality of Hire using his Quality of Hire Talent Scorecard. As Lou says, "If you can't measure quality of hire before the hire, you can't improve it after the hire." You'll agree after watching this powerful video. It will change how you hire people, especially when you discover the factors that accurately predict on-the-job success. For more information about this training, visit our website or send an email to info@louadlergroup.com. The video below provides a high-level overview of our Performance-based Hiring Training for Recruiters. The corresponding handout can be downloaded here. This training is offered for both recruiters and hiring managers in both in-person and live-online formats. For more information about this training, view our website or send an email to info@louadlergroup.com. The video below provides a high-level overview of our Performance-based Hiring Training for Hiring Managers. The corresponding handout can be downloaded here. This training is offered for both recruiters and hiring managers in both in-person and live-online formats. For more information about this training, view our website or send an email to info@louadlergroup.com. The video below provides a high-level overview of our Extreme Networking Using LinkedIn Recruiter class. The corresponding handout can be downloaded here. This training builds upon the foundational elements of Performance-based Hiring and uses those principles to find and recruit passive candidates using LinkedIn. For more information about this training, visit our website or send an email to info@louadlergroup.com.